Not properly accounting for this can lead to serious problems including gross over- provisioning of resources or, conversely, not having enough power, cooling, or space capacity to meet user needs. The current capacity, utilization, and scalability for future growth need to be understood before deciding which data center(s) will become the receiving host. In many cases, however, this information is unknown. And since there can be wide disparities in the size, architecture, and management and reporting structures amongst the data centers involved in a given project, specifying these capabilities may seem to be a daunting task. 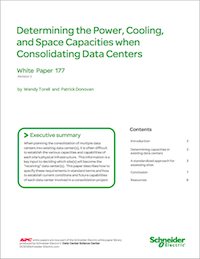 This paper describes a simple, cost-effective standardized approach to establishing current conditions and future capabilities of each data center.